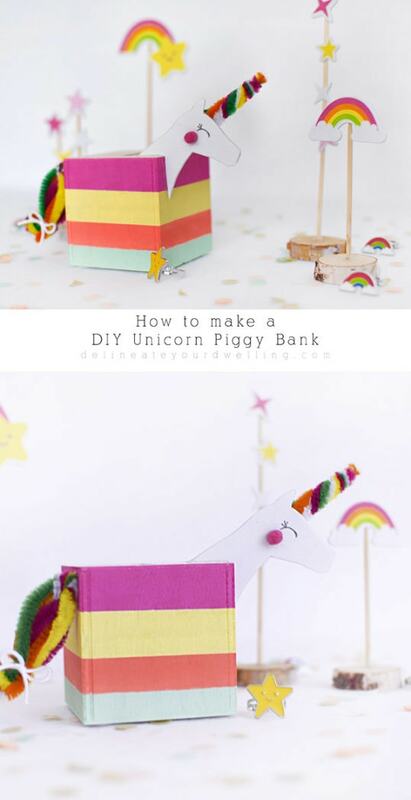 INSIDE : Simple steps on how to make a DIY Unicorn Piggy Bank for you or your children! 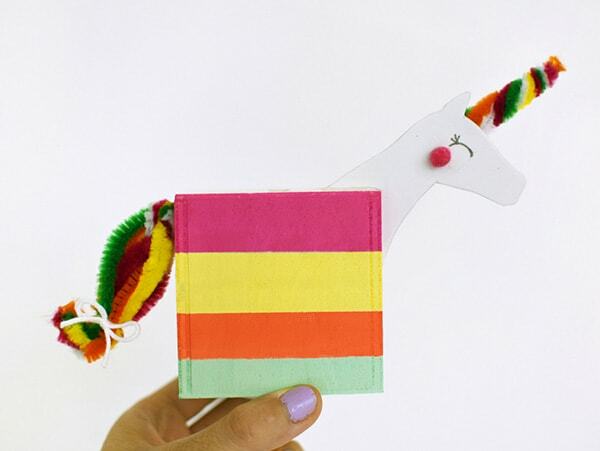 It’s fun to learn how to save money when you’re saving it in a unicorn! I am always trying to come with creative ways to teach my children about saving their money and sometimes you just need a fun piggy bank to excite them! Today I am sharing a super fun tutorial on Oriental Trading for How to make a DIY Piggy Bank for you or your kiddos. And are you looking for Llamas, also? I’ve got fun DIY Llama Piggy Banks, too! We have all been there at some point in our life; rainbows, magical fantasy, colorful whimsy and unicorns! Whether you are just now embracing the Unicorn or they’ve been something you have loved since your youth, I think it is safe to say that unicorns are a trend that just keep coming back. 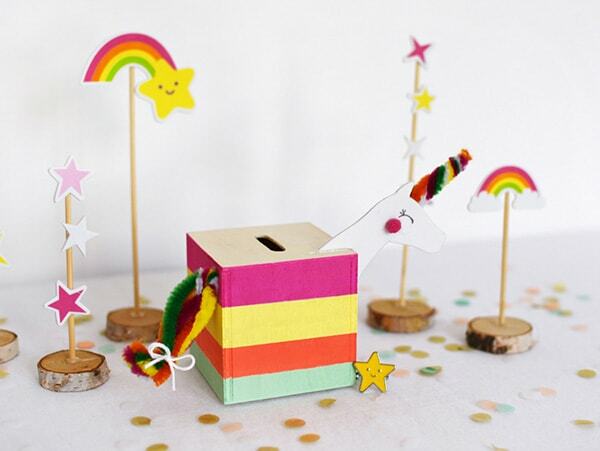 Plus, how fun are the rainbows and stars on the wooden skewers? We have been playing with the rainbows and stars almost as much as the piggy banks – ha! What supplies do I need to make a Unicorn Piggy Bank? Be sure to head over to Oriental Trading’s Fun365 site to see my full tutorial post and supply list for this colorful rainbow unicorn piggy bank project. Although, I think that sweet little mini pink pom pom cheek is my favorite part, hee hee. In addition to seeing how I made this fun DIY, you can also find where I got these adorable star, rainbow and unicorn rings. My daughter thought I was the coolest thing ever when I had some extra rings to pass out to her and her friends!! I love being able to teach my children the benefits from saving and if creating a fun piggy bank will help them better save and get excited about it, then I say it is well worth spending some time making a Unicorn piggy bank. So if you are looking for a fun way to bring color and whimsy to your next kid’s piggy bank, be sure to head to Oriental Trading’s Fun365 site for more information! 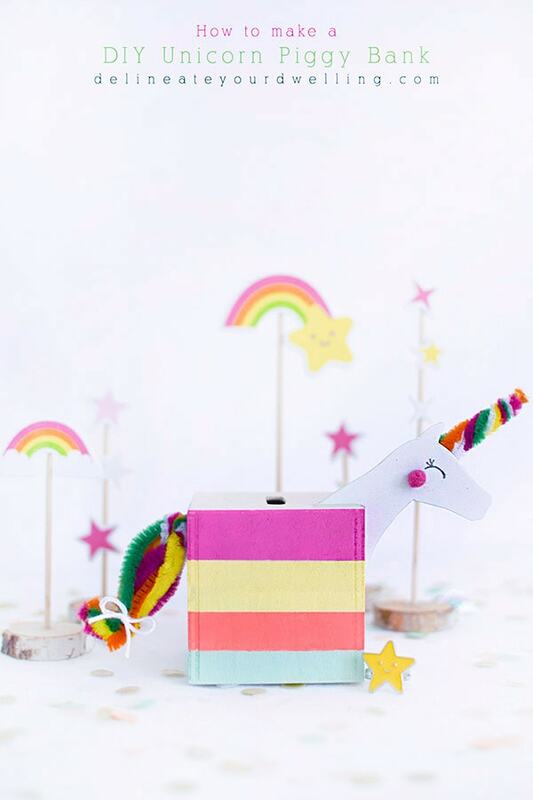 And if you are hosting a Unicorn themed party, these would be great party favor ideas, too. If you’re curious to check out all my Oriental Trading projects, you can head over here!